Search Results for "shipping port"
Vessel at the port. Bollard and ropes. International cargo shipping. Port with cranes. Tanker at the harbor, daytime. Marine shipping jobs. Fascinating time lapse of a busy shipping port with colorful shipping containers and cargo cranes. 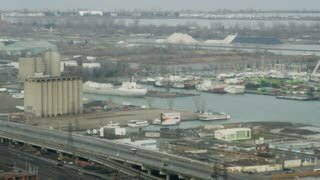 Aerial footage of sea port, international cargo shipping port and container yard from top view. Conventional quay for loading and unloading cargo shipping. Aerial footage of sea port, international cargo shipping port and container yard offering conventional quay for loading and unloading cargo shipping. Aerial drone view workers at a shipping port. The worker's are unloading a shipping container. The ship bringing in containers to the yeard with cranes for lits and barges. Aerial view from flying drone of Hong Kong container sea port, international cargo shipping port and container yard, import export, business logistic supply chain transportation concept. Wide shot of porters, laborers, and passing people at a shipping port in BUrma, Southeast Asia. Large sacks are carried as oil barrels are rolled into place. 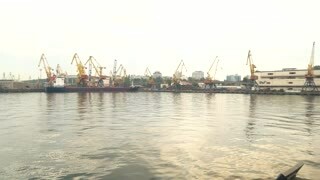 A tilt up time lapse scene of cargo shipping port, Singapore. Aerial drone pull back over ocean waters revealing huge shipping port on coastline next to sandy beach. Wind power generators along the rocks. Hazy cranes in background. Pull back aerial drone view revealing huge coastal shipping port in sunrise morning haze. Cranes silhouette in background & wind generators along the coast. Aerial View Shipping Port Tromso, Norway. A pan to right shot of a shipping port as the ship leaves.